How Long Will Innocent Children Be Slaughtered? In the past week, over 100 innocent children have been tortured or murdered by the regime of Syrian President Bashar al-Assad. In total, a recent report from the U.K. estimates that over 1,300 children have been killed by al-Assad’s forces since the war began. Rimas Qatayfan, ~8 years old, was killed when al-Assad forces intentionally shelled civilian houses in her city on June 30, 2012. 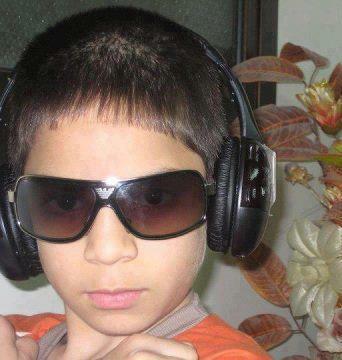 Mohammed Nihad al-Dalli, ~10 years old, was shot in the head and killed by a sniper on April 27, 2012. Every day more small children join this growing list of casualties. As the regime of Syria’s President Bashar al-Assad attempts to thwart the will of the Syrian people who want to overthrow his brutal dictatorship, countless hundreds of small children have been caught in the crossfire. The British government is reporting that al-Assad’s forces have begun to intentionally target civilian homes and schools as a tactic to demoralize the Free Syrian Army who are challenging al-Assad’s control. A recent report from the U.N. states that al-Assad’s forces are also torturing the captured children of rebel fighters and are using them as human shields in combat. 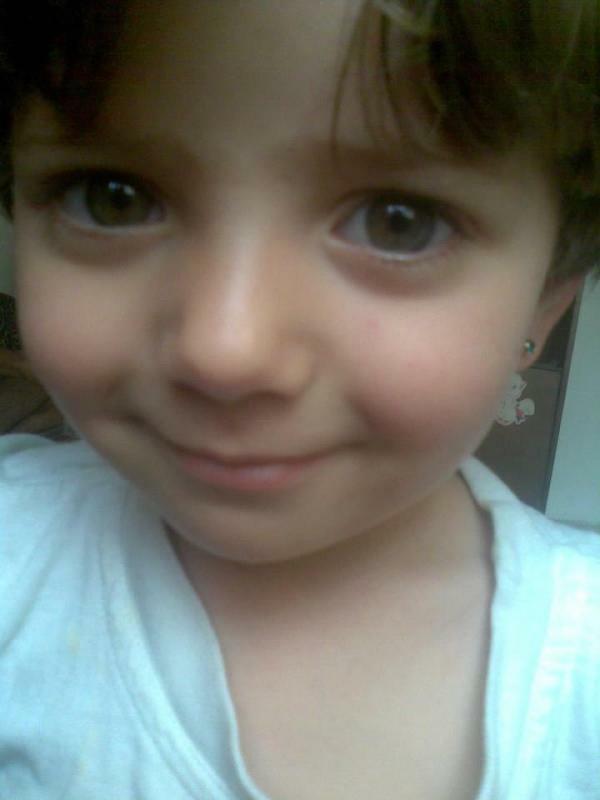 Rayan Amjad al-Amyan, ~8 years old, murdered July 8 in Daraa, Syria, by al-Assad forces. Numerous soldiers who have since defected from the al-Assad’s Syrian Army have reported that al-Assad’s forces are placing civilian children on tanks in order to deter rebels from firing or attacking as the tanks swept through rebel-controlled areas, typically killing more civilians in their paths. In March a bus carrying al-Assad raiders pushed children — all younger than ten years old — against the bus windows to keep rebel forces from attacking their convoy. After the raiders carried out the attack, the children were summarily executed by the al-Assad soldiers. Recent U.N. reports also show that al-Assad’s regime has been ruthlessly torturing children with whips, beatings, cigarette burns, and electrical cables and then sending the tortured or maimed children back to their families in order to deter them from helping Syrian opposition forces. Videos available on YouTube — which will not be linked here because of their extremely disturbing and graphic content — show the aftermath of an al-Assad attack on the Syrian city of Aleppo earlier this week. Littering the streets were countless civilian corpses, including numerous women and children. Many of the bodies were burned or charred due to artillery from government tanks and helicopters. Dismembered torsos and limbs left behind by the government artillery had been gathered into a pile on one side of the street. The corpses of several small children lay clearly visible, dead not from artillery but from sniper bullets as the children had rushed into the street to recover their dead families. Survivors were forced to leave the corpses in the streets as al-Assad snipers ruthlessly shot anyone — including women and children — who came outdoors, even as the bodies of their family members rotted in the scorching Syrian sun. As sad as it is, in war civilian deaths are always part of collateral damage, and that includes the unfortunate and unintended deaths of children. But what is happening in Syria is something entirely different. The deaths of these children are not unintentional collateral damage. The illegitimate regime of Bashar al-Assad is intentionally targeting, torturing, and murdering innocent children, almost every day. When you are reading this, it is almost certain that several more children will have been tortured or murdered since the time I wrote it. Ibrahim Ali Talluzi, 11 years old, murdered August 4 in Damascus, Syria, by al-Assad forces. The rebel forces, who have united under the banner of the Free Syrian Army, have repeatedly asked the West for aid in battling al-Assad’s regime. Thus far President Obama has only authorized medical supplies and communications equipment to be sent to the rebels. Meanwhile the rebels are forced to use only small arms and improvised explosives against a government army and air force that utilizes tanks, artillery, bombers, and helicopters. Al-Assad’s military is also receiving aid from Iran, who are somehow invested in keeping the brutal dictator in power. The Syrian people are seeking freedom and peace from a regime that is violating basic human rights and continues to murder innocent civilians every day. They are asking for the United States to help — not for the U.S. to send troops or forces to battle al-Assad, but that the U.S. provide armaments and weaponry so that the Free Syrian Army can at least stand a chance at protecting their families and children from the Iranian-backed military of Bashar al-Assad. Western and Middle-Eastern military analysts have all but agreed that al-Assad is certain to fall from power eventually. The piercing question mark is how long it will take. Without the aid of armaments from another nation, analysts say, the civil war could go on for years. Years of more civilian deaths and more children being ruthlessly tortured and slaughtered. In public the U.S. speaks support for the Syrian rebels and for the downfall of Bashar al-Assad. U.S. Senator John McCain has called for the aid of the Free Syrian Army. Former Governor Mitt Romney has called for the aid of the Free Syrian Army. Secretary of State Hillary Clinton has called for the aid of the Free Syrian Army. Secretary of Defense Leon Panetta has called for the aid of the Free Syrian Army. These American leaders understand that America cannot call itself the world’s greatest proponent for freedom and democracy and then do nothing when those who seek freedom and democracy ask for our help. But only President Barack Obama can approve the sending of armaments to the Syrian rebels who fight for freedom and their families. The question is, how many more innocent children have to die before President Obama decides to help the Syrian people? 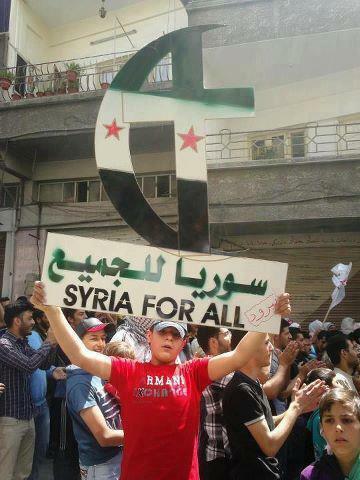 A teenage protester in Syria holds a sign that says “Syria For All.” The crescent moon and the cross over the sign symbolize the historically peaceful coexistence of Muslims and Christians in Syria.